Russia has intervened to enforce the UN announced ceasefire in Syria. A daily truce lasting for five hours will be maintained in eastern Ghouta province of Syria along with the establishment of a humanitarian corridor to facilitate civilian movement in the region. Looking at the heavy bombardment of Eastern Ghouta, the UN Security Council had called for a country-wide ceasefire that would last for 30 days. The region is in acute need of access to medical drugs, equipment and commodities and also requires its medical casualties totaling 750 to be evacuated. Heavy bombardment from the Syrian armed forces in the last seven days has led to deaths of around 556 people, one of the heaviest of all times in the Eastern Ghouta region. The numbers were furnished by Syrian Observatory for Human Rights, a war monitoring agency based in the UK. The severity has however, lessened it said, after the announcement of the UN resolution calling for a cease fire though the killing and firing still continues. Civilians are using the intermittent lull in firing to stock up provisions. Russia’s Foreign Minister, Lavrov stated that all partners of the Nusra Front; an affiliate of the earlier al Qaeda which includes the Jaish al-Islam and Ahrar al-Sham would be excluded from the ceasefire terms. Failaq al-Rahman and Jaish al-Islam are the significant two rebel groups based in Eastern Ghouta. 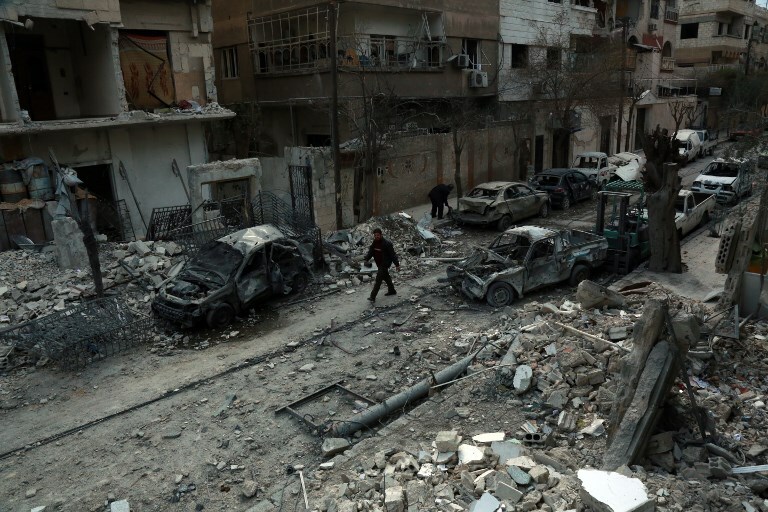 The opposition has asserted that exclusion of the Nusra Front from the ceasefires have enabled the Syrian government to continue with its bombardments. Syrian government has vehemently denied the use of chemical weapons in the war. Russia stated that reports of people being affected by poisoning through chlorine gas on Sunday were rumors raised to disrupt the truce procedure. The Syrian war which is ongoing since the last eight years has led to the fleeing of Syria’s 50% population from their homes besides causing deaths of people in huge numbers. Pictures of the dead killed in the firing continue to be shown by the Syrian Observatory for Human Rights.